Week| 20, halfway, I can't believe it! Total Weight Gain| Yeah, I'm pretty sure I'm pushing the plus 15 right about now, if not a little more. I'm thinking I'm a little ahead of the curve, but the doctor hasn't mentioned anything yet. Symptoms| This week has definitely been the most stressful of all the weeks. I've been in and out of the doctors a handful of times with symptoms that seemed unusual to me and some spotting that pretty much freak me out due to what happened with me previously. I had to take it easy for a few days at the end of last week, but they say everything seems fine. The hard thing about pregnancy is there isn't always an explanation for why something is happening, which drives me crazy! Cravings| Definitely downing the cheese, which probably attributes to my more then healthy weight gain. I'm not off the spicy California rolls, but I'm totally leaning more towards the cheese these days. Sleep| It's been pretty darn good every night, except for last night! Had a little tossing and turning - hence why this post is coming to you a little later then normal today! When I finally made it back to sleep I did not want to get up. Clothes| I finally added a good few pairs of pants to the mix that I found at Kohl's of all places, there maternity section is so small you might miss it, actually I did. But within that teeny tiny section a found a few pairs of dress pants that had ample enough stretch for me to dance around in. The department I'm now struggling in is tops. I'm hitting the point where a lot of my pre pregnancy dress tops just aren't working anymore, as you can see in the photo above. That shirt should fall smoothly down my back, but now it gets caught up on my rear cause it can't fit all of me. 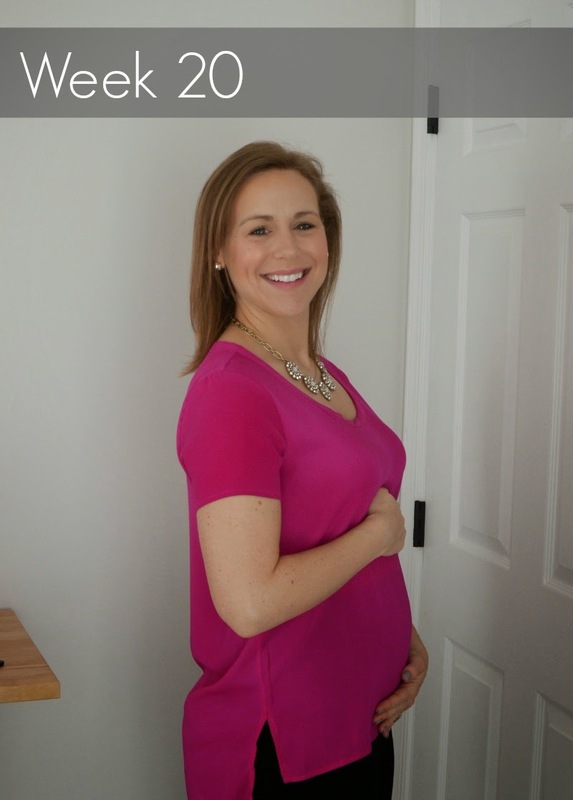 Most maternity tops seem to either be plain cotton, which isn't dressy enough for work. Or the dressier ones look like tents with some sort of belt or drawstring above the belly, just not feeling it. Workouts| Totally did nothing this week. Honestly I think I over did it last week, and was told by my doctor the later part of the week to take it easy through Monday. It's really hard for me to know my limits with my job because I'm used to being on my feet dancing and teaching all day and it just takes more out of me then I think. I'm trying to find my happy medium. Nursery| My vision is starting to come together - at least in my head! We've decided to go with the same laminate floor in there as we did in my office so next step is to get that ordered. Movement| There has been some definite flutters. Usually I can feel them either in the morning when I'm sitting with my tea, or once I crawl into bed at night, but they are still few and far between. 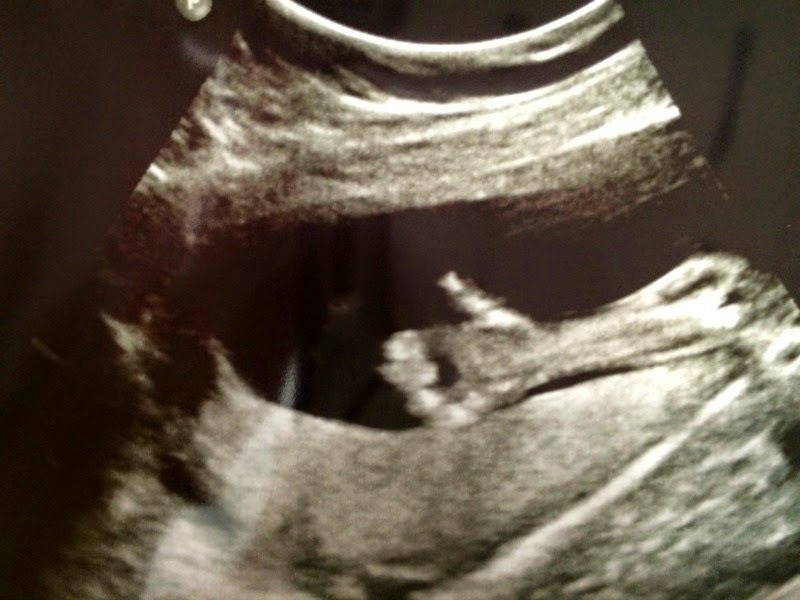 Best Moment this Week| Having our anatomy scan and finding out we are having a little girl! Plus seeing at the different parts and knowing that everything is looking ok in terms of growth and development. We even got a thumbs up from her, almost like she was saying "everything's ok!" Ohhh..myyyy...gosh! What a SCARY week for you! So glad everything is ok now...but, girl, you better take it easy! So excited about baby girl! I can't believe you're already half way there! And happy to hear everything vlooks perfect and she looks healthy! Have a great weekend! I can't believe you're halfway already! It's amazing how time flies. I'm sorry that you had such a stressful week, but I'm glad that the doctors seem to think everything is okay - I think strange symptoms and spotting would freak any mommy-to-be out! Kohl's rarely disappoints! Have a great weekend, girl! My nerves were definitely a mess! I'm trying to find my balance, but it's hard when you just don't know where that limit is!! It's crazy how fast it goes by, it makes me a little worried for all that we have to accomplish before she gets here! It really does go by so quick, and yet so much stuff left to do - actually pretty much everything left to do! Hearing that heart beat is always a reassuring sound when your nerves are a wreck! So glad Kohl's came to the rescue for me!